We visited the Italian island of Sardegna (Sardinia) in the summer of 2013, and we still regard this holiday as one of our favorites. It was the ideal mix of relaxation, culture, nature and excellent food. We did consider to fly to Sardinia, but after comparing the costs we decided to go by car. This means we could add a roadtrip to our holiday, taking in a lot of culture and experiencing the couleur locale through couchsurfing. It turned out to be a perfect combination, and we ended up with a number of unforgettable memories. Maybe the most remarkable story is about how we came across Tarquinia. It was on our way back, and we had just landed on the Italian mainland (Civitavecchia) by ferry from Sardegna. We needed to drive to our next couchsurfing address which was in Florence, but the roads were very confusing and I managed to take the wrong exit. The sun was out and we were in a very relaxed mood, so we didn’t feel the need to get back to the original route. Instead, we took a scenic route through the countryside on the border between Lazio and Tuscany. 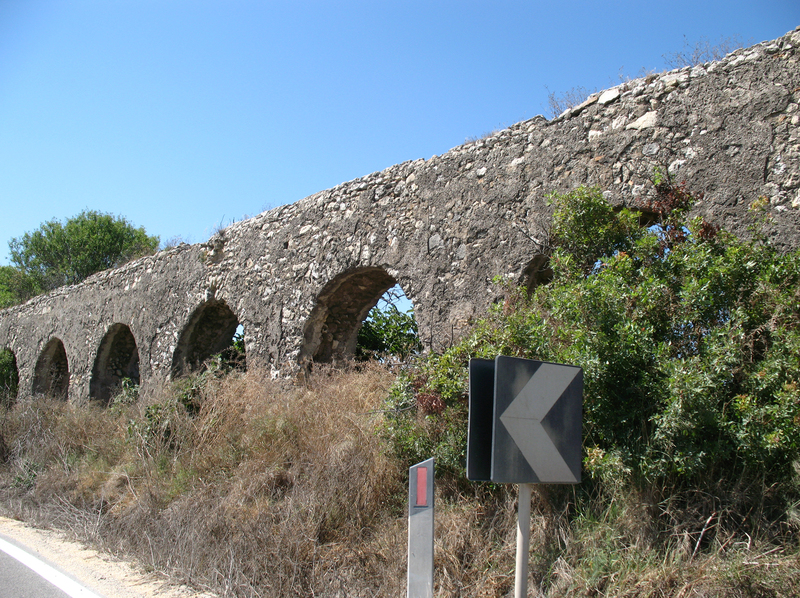 Roman aqueduct near the road. All of a sudden, we saw the sign “Tarquinia” and looked at each other, because we did recognize this name. However, we couldn’t really remember from where. A few kilometers down the road we saw a Roman aqueduct and it is at that moment that we realised that Tarquinia has a UNESCO world heritage site. 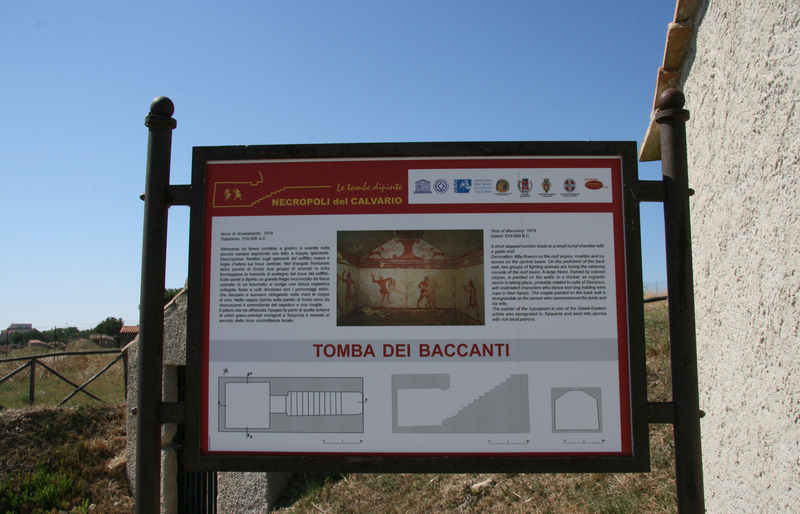 I stopped by the side of the road to take our UNESCO world heritage book out of the door compartment and looked it up: “Etruscan Necropolises of Cerveteri and Tarquinia”. We had never been to any archeological site from the Etruscan civilisation before and obviously didn’t hesitate to seize the opportunity. By the time we arrived at the site, we realised Febe was sleeping, so we had to take turns to visit the site. I went first, bought a ticket and walked into this surreal, fenced, sloping area dotted with strangely shaped buildings, roofs covered with rounded tiles, and clusters of what appeared to be old pottery. 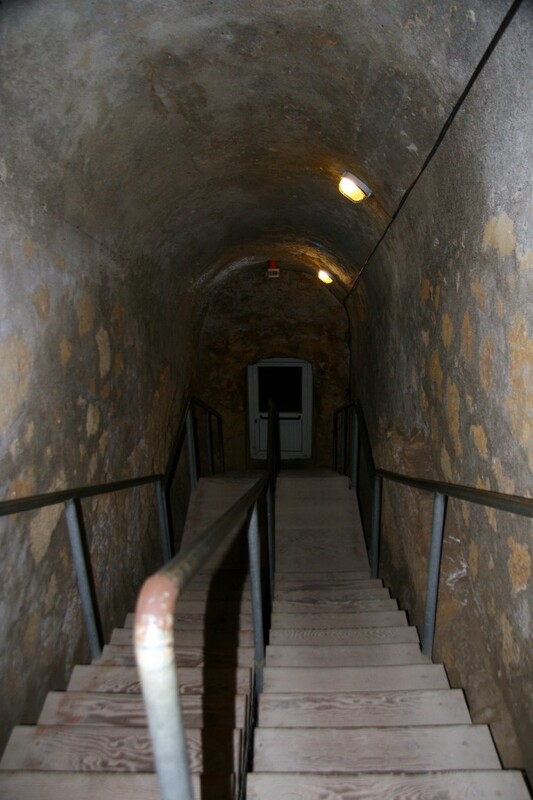 The pottery turned out to be the remains of stone urns and each building covered the entrance to an underground grave. Stone urns are scattered about the place. The entrance of each grave is covered by a little building. You then have to push a button to illuminate the grave. 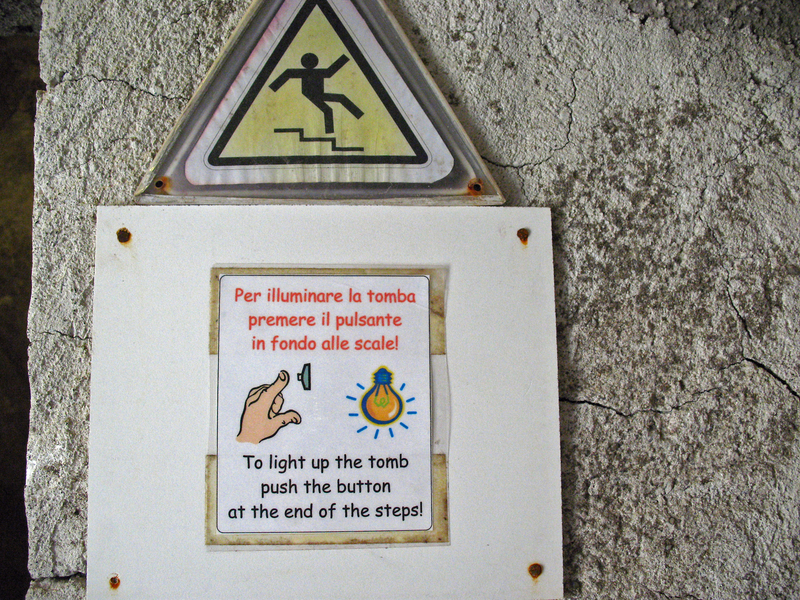 Informative sign at the Tomba dei Baccanti. Once lit up, the graves unfold their treasures. 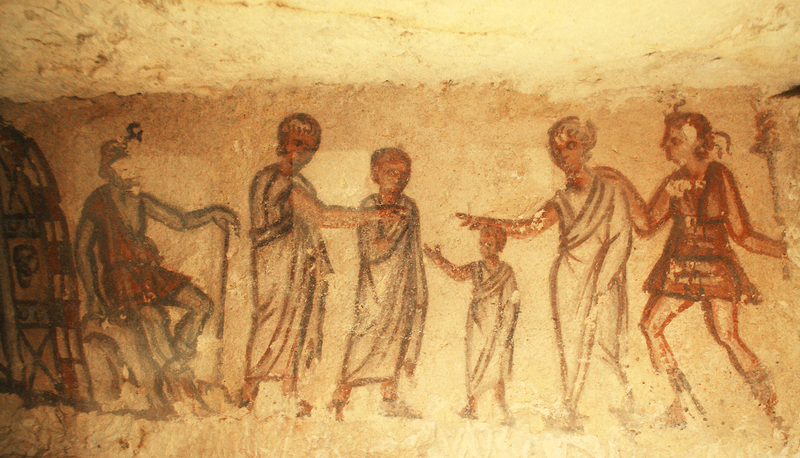 This one is the “Tomba dei Leopardi”, 470 B.C. The scene shows a banquet in honour of the dead. 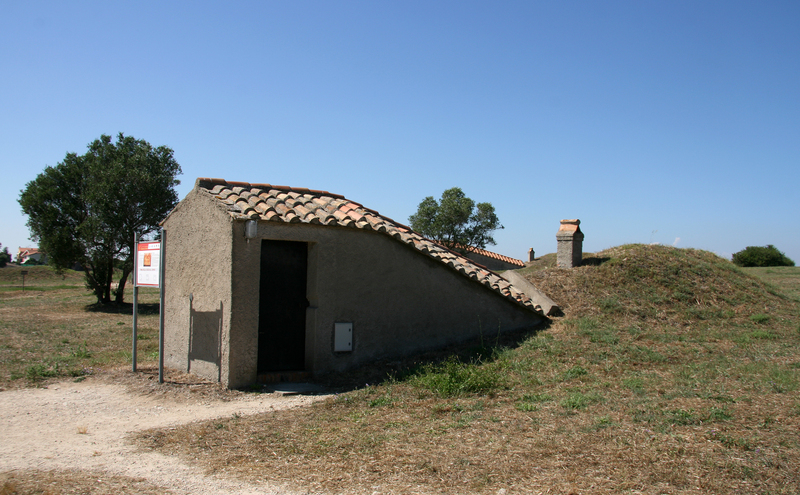 “Tomba 5636”, a different type of tomb. It dates back to the second half of the third century B.C. The graves are carved into stone benches next to the walls. 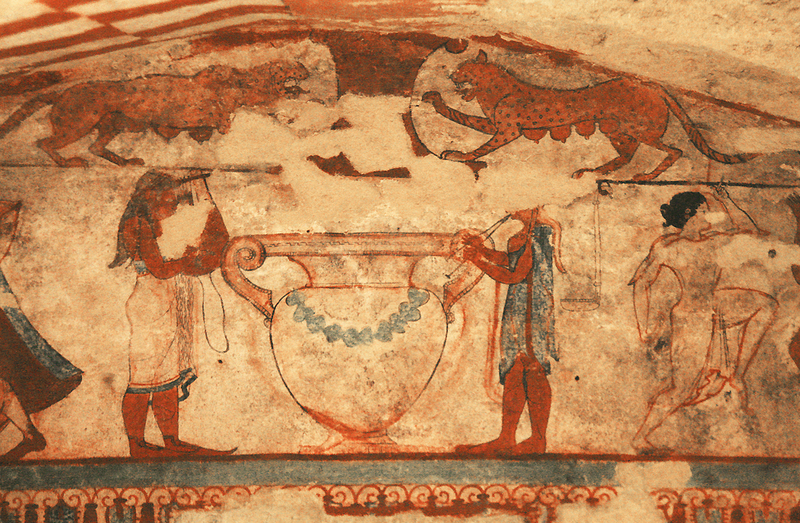 “Tomba dei Fiorellini”, 475-450 BC. You can see two red and black cockerels facing each other, ready to fight. Below them there is a banqueting couple. 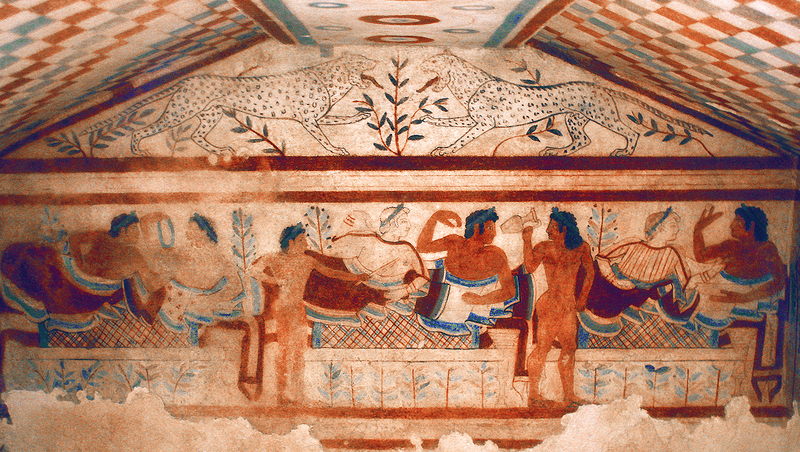 “Tomba delle Leonesse”, 520 BC. Main theme is music and dancing here. On the right side, a man is reclining on a pillow. Note the dolphins below the scenes! I want to conclude here by stating that this site is currently my favourite world heritage site, for several reasons… First, the fact that we came across it completely unintentionally. Second, because I had never seen such ancient tombs before, and these were of astonishing beauty and quality. Third, because of the great management concept. 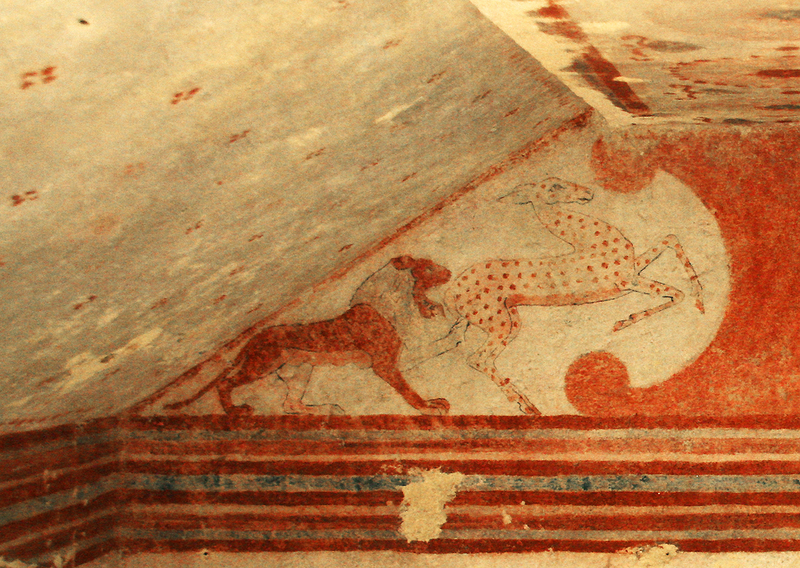 And finally, I must say the visit felt like a treasure hunt to me: going downstairs to visit a subterranean tomb, waiting for the light to go on and marveling at the fine details of the exciting stories painted on the walls… We definitely recommend this one! 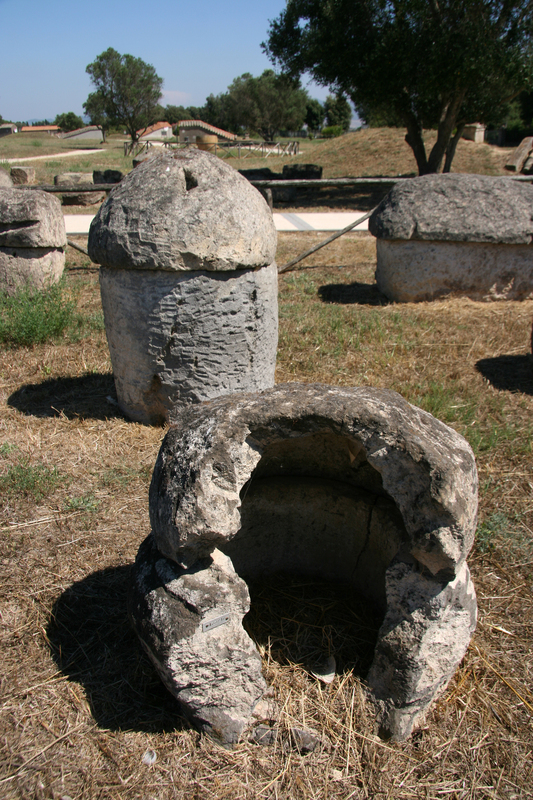 This world heritage property consists of two sites: the Etruscan necropole of Tarquinia and the Etruscan necropole of Cerveteri. So far, we only visited the one in Tarquinia. 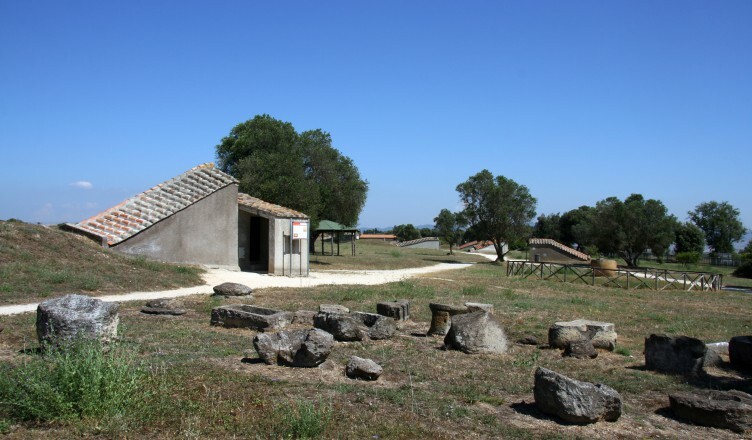 These are two large Etruscan cemeteries, which show us different types of burial practices between the 9th and 1st century BC. 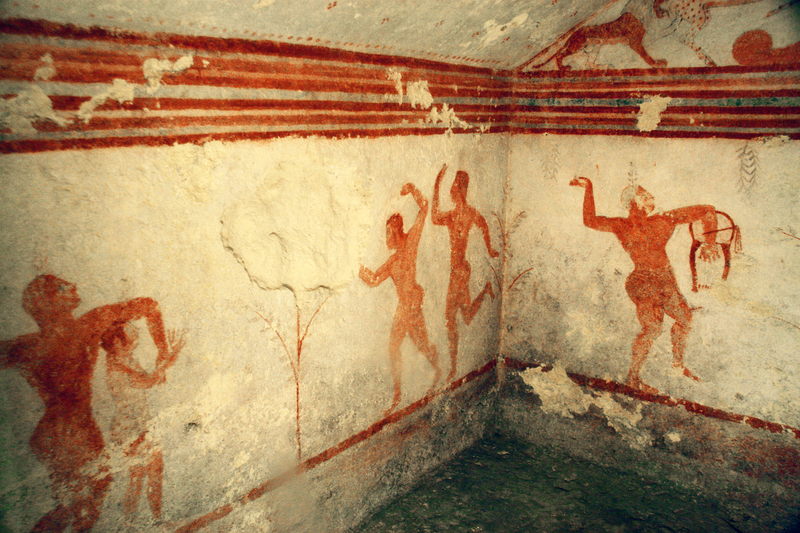 They also constitute an important and exceptional testimony to the ancient Etruscan culture, the first urban civilization in the northern Mediterranean. 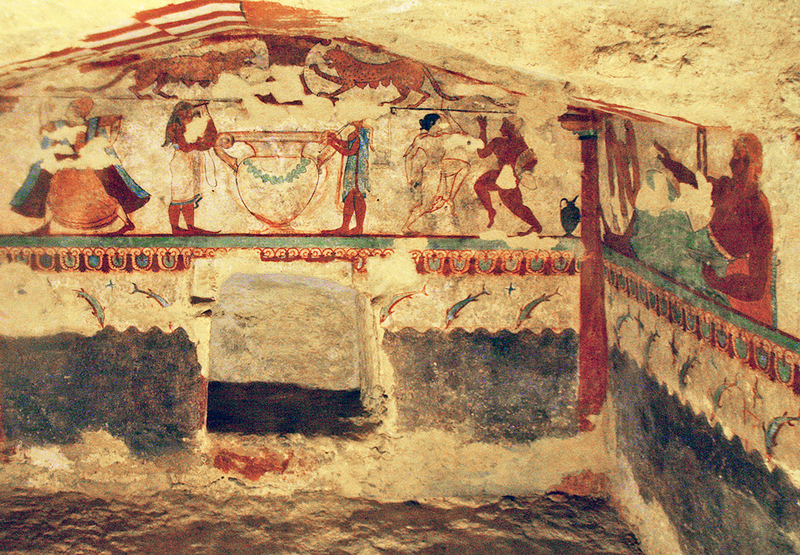 The necropolis of Tarquinia (known as Monterozzi) contains 6000 graves cut in the rock, including 200 painted tombs, accessible via sloping or stepped corridors. 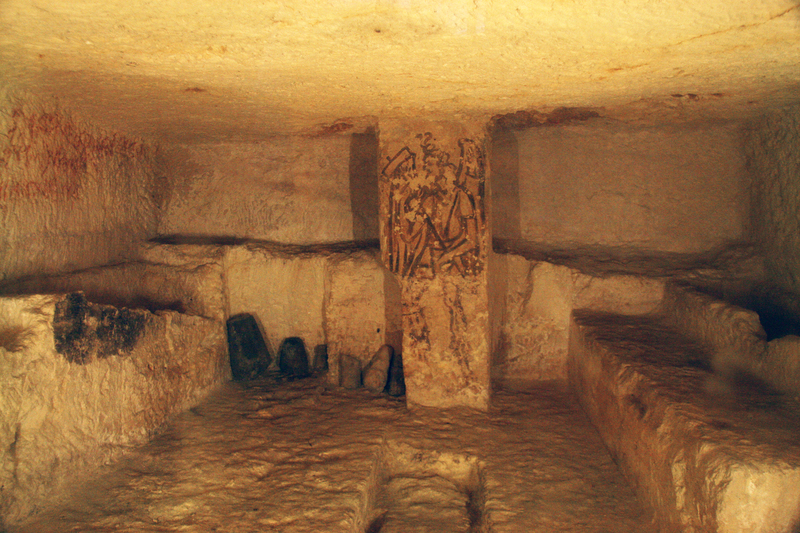 The inner walls of the tombs are decorated with carvings or wall paintings of outstanding quality. 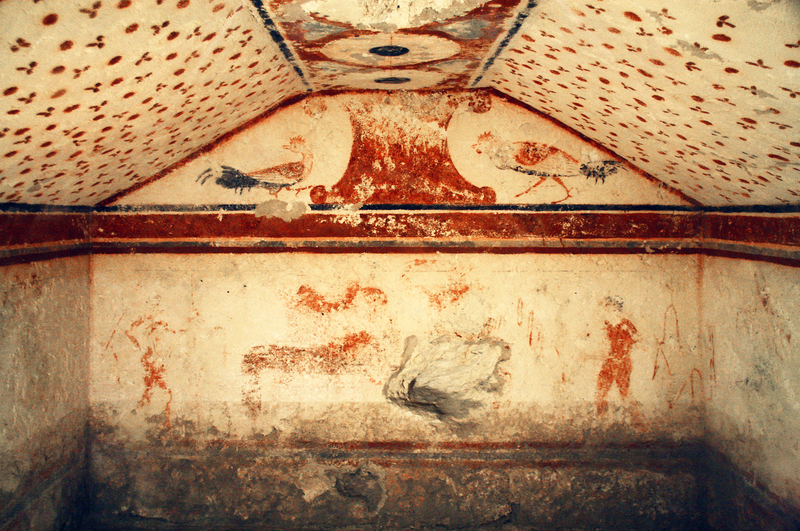 Frescoes in the tombs depict daily life, ceremonies and mythology as well as artistic abilities.